Heat 1 tbsp. oil in a large frying pan over medium-high heat. Add spices and toast until fragrant, about 1 minute. Add onion and garlic and cook until beginning to soften, about 2 minutes. 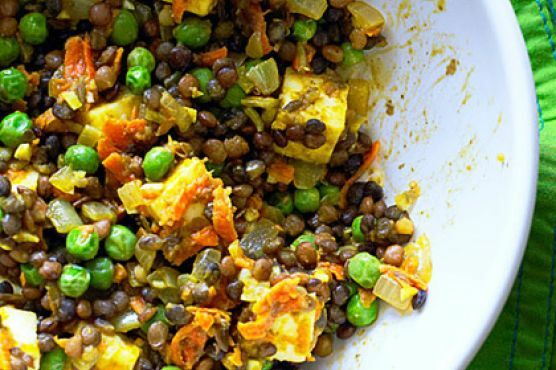 Add carrot, peas, lentils, salt, and remaining 2 tbsp. oil, stirring to combine. Stir in paneer and cook 2 minutes. *Find cooked lentils at Trader Joe's. Find paneer--a fresh cheese that's pressed until firm--at well-stocked grocery stores or Indian markets.